Before I talk about this recipe, let me just say that I am very aware of how ridiculous the blob of Greek yogurt looks in these pictures…what was I thinking when I did that? Well, I thought at first that maybe it would be some sort of creative swirl like you see the professionals do on TV. And then I decided that I was really hungry and didn’t care enough to fix it. Don’t let the blob discourage you from making this! It’s awesome, I promise. I got the idea for this recipe from a fitness magazine, either Self or Fitness, I honestly can’t remember. 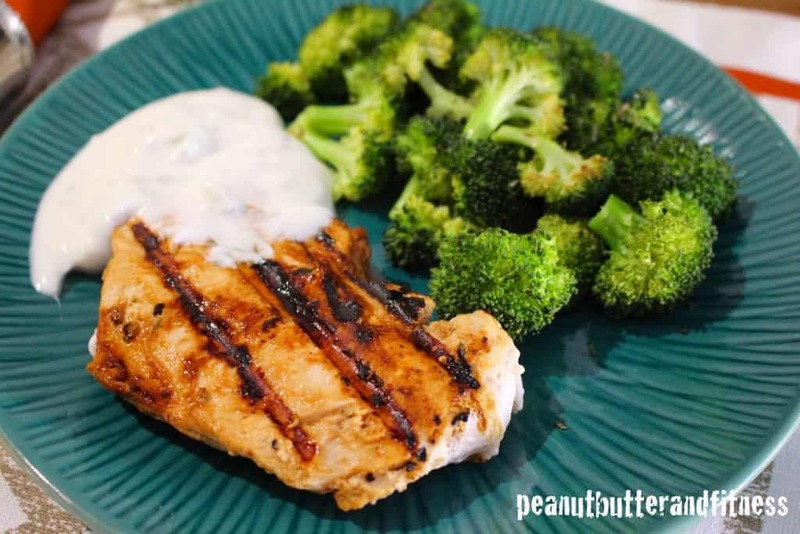 You basically use part of the Greek yogurt sauce as a marinade for the chicken. I was a little skeptical at first (and still am a little bit) because how can Greek yogurt make a good marinade? I’m still not positive that it did, but when I put the chicken on my George Foreman grill, the yogurt sort of caramelized. A lot of it stuck to the grill plates too. I will say that the chicken tasted really good this way, but if you don’t want to use so much Greek yogurt, just use some olive oil, rosemary and lemon juice as a marinade instead. If you don’t have a Misto or something similar, you should look into getting one. You put whatever oil you want into the bottle, pump it up to pressurize it, and then you have a “mister” to spray olive oil on your veggies rather than drizzling. It’s not a spritzer either, it’s more like an aerosol so you use less oil. I picked mine up at a Marshall’s for less than $10. It may have been closer to $5, I can’t remember though. In a small bowl, mix yogurt, garlic, lemon juice and zest and 1 tsp of rosemary. 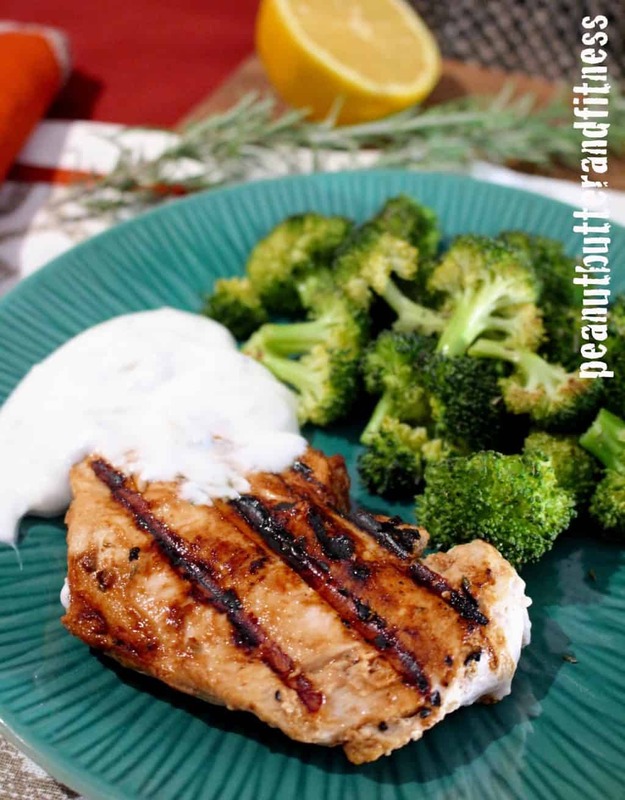 Marinate the chicken breasts in about half of the yogurt mixture for 20 minutes. Preheat oven to 400 degrees. 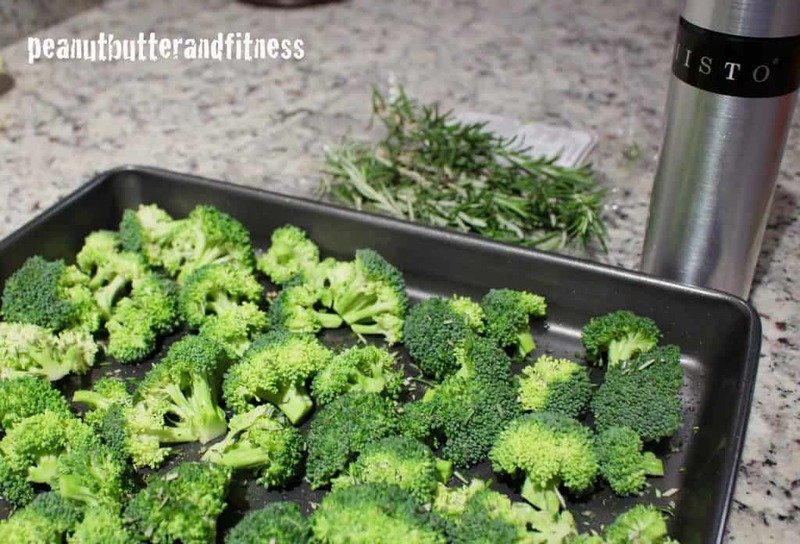 Arrange broccoli florets in a single layer on a baking sheet. Using an oil mister bottle (like Misto), lightly spray broccoli with olive oil. 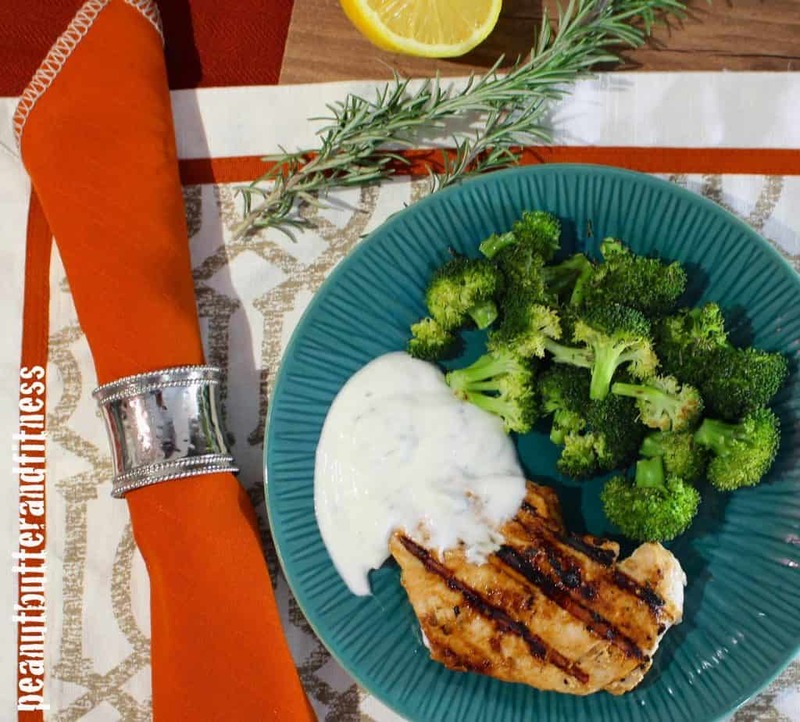 Sprinkle 1 tsp of rosemary on top of the broccoli and bake for 12 minutes at 400 degrees. 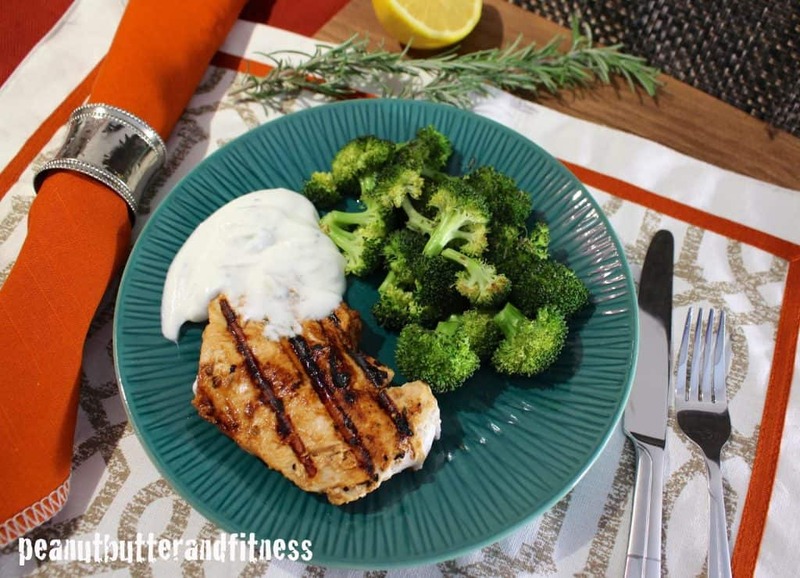 While the broccoli is baking, grill the chicken breasts until cooked through, about 5 minutes on a countertop grill. 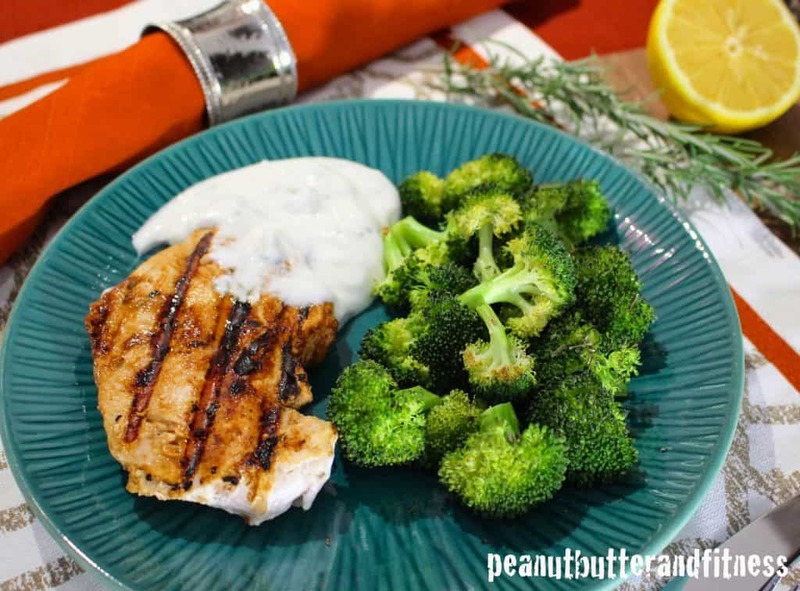 Serve remaining yogurt mixture with chicken and broccoli. Do you like the placemat I used? I picked it up at Target yesterday, I’m loving it!